When a perfume company like Tom Ford produces two distinct fragrance lines, one upper-tier prestige (the exorbitantly expensive, limited-distribution Private Blends) and one ‘simply’ prestige (the more affordable and widely distributed Signature line), I’d expect the quality of ingredients or the quality of the formulas to differ (for instance, the Private Blends should smell “luxurious” and/or innovative compared to the Signature scents). As the Tom Ford lines stand, that is not the case; there are hits and misses in each line (more misses in the Private Blends because the offerings are more numerous). I liked the first masculine Signature fragrance: Tom Ford for Men (2007); I liked Grey Vetiver (2009) a little less. Tom Ford just launched the third Signature men’s perfume — Tom Ford Noir; the fragrance notes sound promising: bergamot, verbena, caraway, baie rose, violet flower, black pepper, nutmeg, iris, geranium, rose, clary sage, opoponax, amber, patchouli, vetiver, civet and vanilla. Tom Ford Noir begins with a creamy, slightly vanillic bergamot note tinged with “green,” reminding me immediately of Guerlain Jicky. The citrus opening fades to reveal powdery opoponax. In mid-development there’s an almost-minty “tingle” present in the brash verbena-pepper-(rose) geranium accord (accent on geranium). Finally, light amber, a note smelling like coumarin, and “civet” musk round out the perfume. As I smelled Tom Ford Noir’s stages of development, a beauty parlor scenario came into focus: a customer, wearing Jicky (good taste!) and lots of make-up (opoponax), goes into a salon, gets her hair washed with an Aveda shampoo (verbena-pepper-geranium) and then has an old-style (semi-stinky) permanent wave (civet). As she leaves the shop…she spritzes on more Jicky. 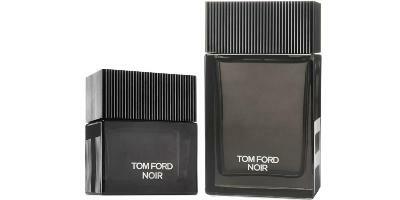 Tom Ford Noir almost succeeded: I enjoy the opening and closing of the perfume…but the middle! I describe the heart of the fragrance as “shampoo”; a friend said it smelled like an “environmentally friendly” cleaning product. Those geranium-tinged notes are awkward, not interesting, and they make the perfume smell unfinished. These problematic notes last about 20-30 minutes on my skin. If, like me, you enjoy the opening and closing of Tom Ford Noir — buy Jicky. Has Tom Ford, who used to spearhead some interesting and innovative fragrances, given up control of his perfume business? Have his tastes changed? Is he tired of perfume? At any rate, all of a sudden, after the Jardin Noir collection and this one, the prospect of another Tom Ford perfume does not excite me at all. Tom Ford Noir, certainly unisex, has so-so lasting power and sillage; it’s available in 50 ($90) and 100 ml ($124) Eau de Parfum. I might be one of the few who actually liked it. Yes, I already bought a bottle, lol. Most of my friends gave it a thumbs down. Carlos: are you at 1000 bottles yet? Ha! That’s a fine review but your review of Jicky is Proustian. Oh Kevin I was so nervous when I clicked on and saw your review! I have been waiting for this to hit oz since it was announced ! I have to tell u I’m not a fan of Jicky at all , I have tried it on skin 3 times and I have trouble with the civet ! Im totally scared now to tell the truth, as I hair stylist I know those smelly perm aromas and it made me giggle , thanks for your honest review, I think this could be a spender or a saver for me at this point , can’t wait to try it and see ! Sinner: yes, interested in what you end up thinking…. Between this Noir and Coco Noir, noir is really striking out recently! It would be kinda boring if everyone loved or hated the exact same thing. Count me in to the camp of Coco Noir “likers” — the bottle pushed me over the (good) edge. Noz: enough with the noirs…let’s shift to blancs at least! KR: sounds good…especially white cherry! Tim…thanks for writing back. No tester for THREE weeks? A new selling tactic! Personally, i loved this..on me..on my husband…pretty much an aphrodisiac scent for me..however, the scent just doesnt last..its gone in like 5 minutes for me.. I was looking forward to “Noire”. But it’s an unremarkable peppery smell. And it doesn’t last on skin. It’s not worth buying. usual behaviour I actually ordered a bottle. this is a lovely ambery perfume (for men???). disappointments. You’ll find that with any perfume brand. As for Jicky: I get none. Anyway, Aimé Guerlains Jicky, as well as all the Jacques Guerlains, are, in my opinion, unrivalled and probably will be. This is just not possible…Shalimar is Jicky à la Vanille. This cannot be true: Shalimar is Jicky à la Vanille. Got a sample of this and tried it a few days ago, reminds me a LOT of a cleaned-up, watered-down Noir de Noir. I know I’m probably missing some of the nuances, but as soon as I applied it and after wearing it a few hours I knew I had experienced it before. I’m late to the party, but when I tried my sample last night, I sniffed after about an hour and got a less-sweet Prada Candy! I’m wondering if this worths a purchase. I love jicky, mouchouir de monsieur and would like to know if this is ok for blind buy. Others says that is closer to habit rouge. What do you say? shall i take the risk and blindly buy it or it doenst worth it? i want to get a tom ford perfume as i never it. what do you suggest? I’m in late 30s.